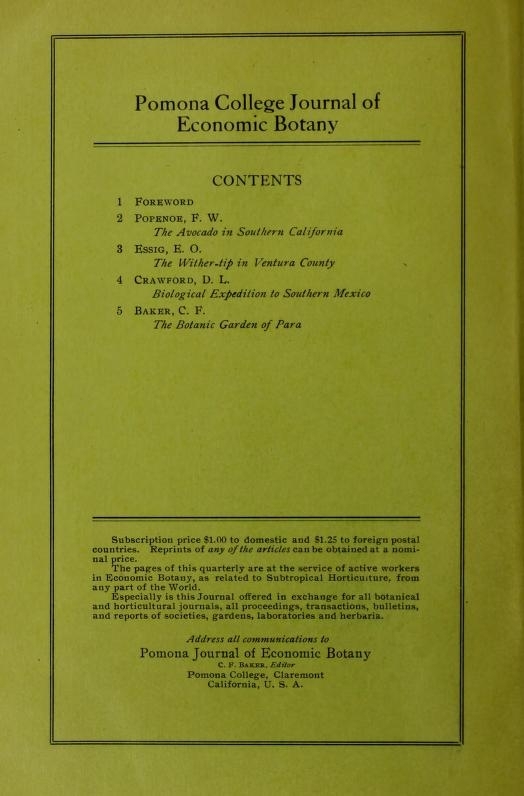 Plant diseases– their occurrence and severity– result from the impact of three factors: the host plant, the pathogen, and the environmental conditions. This is represented with the disease triangle. If any one of the three factors is missing, the triangle is not complete, no disease will occur. 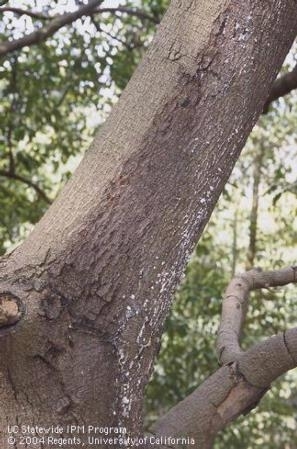 Simply, plant disease will not occur if there is no viable pathogen, or no susceptible host plant, or the environmental conditions are not favorable. The severity of disease depends on the favorable level of each factor. How susceptible is the plant? How virulent is the pathogen? How conducive are the existing environmental conditions in supporting disease and pathogen spread? The triangle also helps illustrate that the 3 factors are interacting with each other. 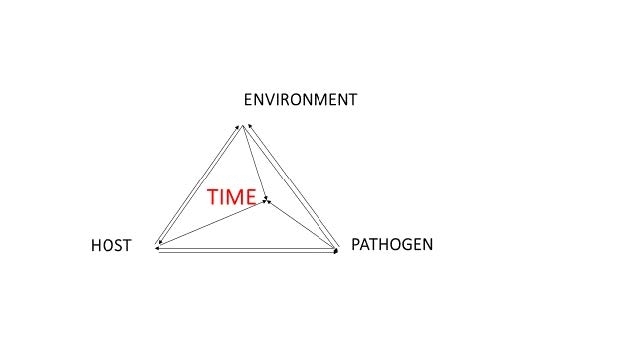 The clearest example of this is how the environment factor interacts with the pathogen and host factors. Previous blogs illustrate the importance of leaf wetness on pathogen infection and disease severity. 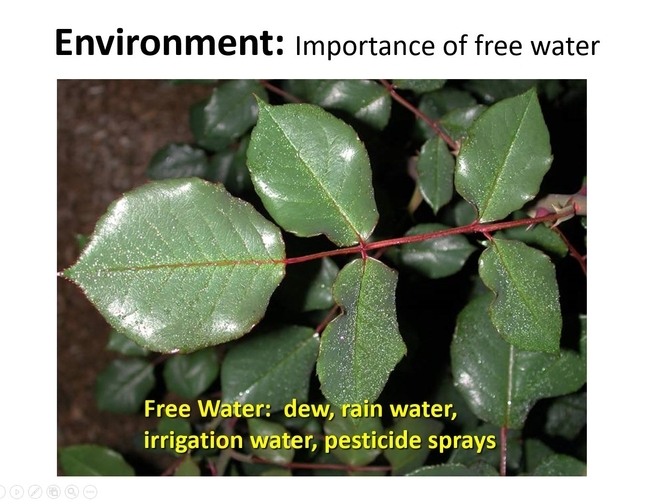 Long durations of free water on a susceptible plant can increase pathogen infection and disease severity. At the same time, the low- sunlight conditions, when these wet periods could occur (e.g. 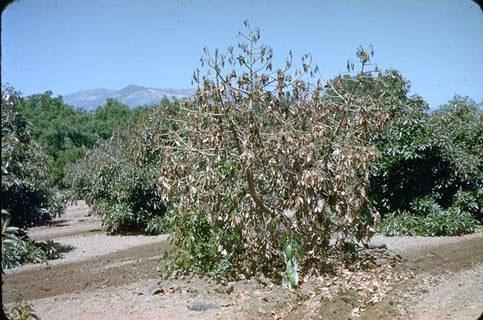 winter), could also be stressful to the plant, and the plant is less likely to mount defensive reactions to fend off infection. Learn about the biology for any disease you are managing. 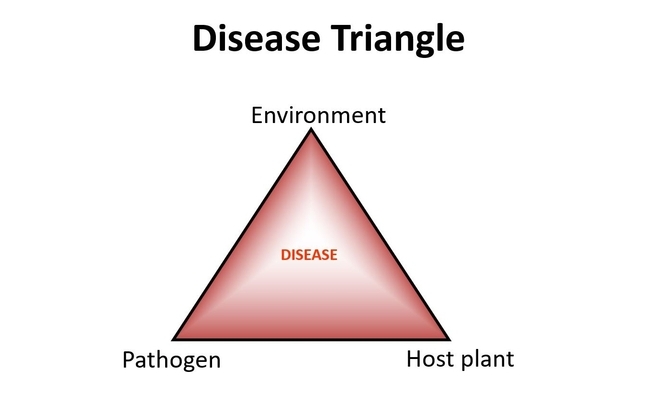 Consider the disease triangle and the three interacting factors, and how management practices might help weaken or break the triangle's bond. For example, could you grow non-susceptible plant varieties or species? Could you eliminate the pathogen through judicious sanitation practices? Could you manage leaf wetness and relative humidity to create unfavorable environmental conditions for disease? Could you grow non-susceptible plant varieties or species? 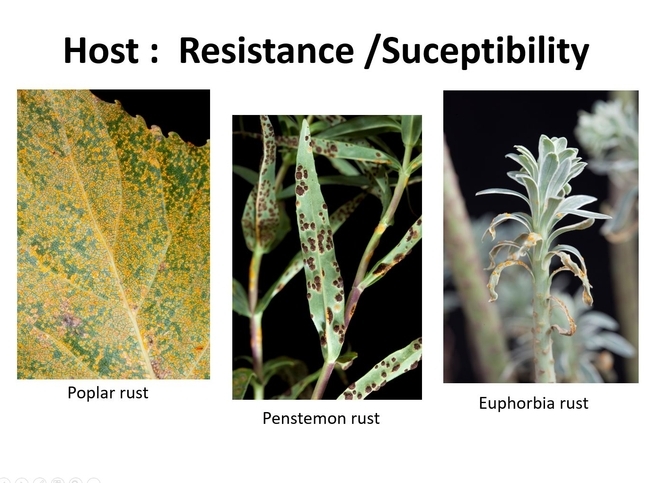 Although these three plant hosts all have rust diseases, each host is infected with a unique plant pathogen that attacks its specific host. In managing these diseases, a strategy of host resistance might be employed, where crops of non-susceptible hosts are rotated into the infested area. Conceivably these three hosts could be rotated. 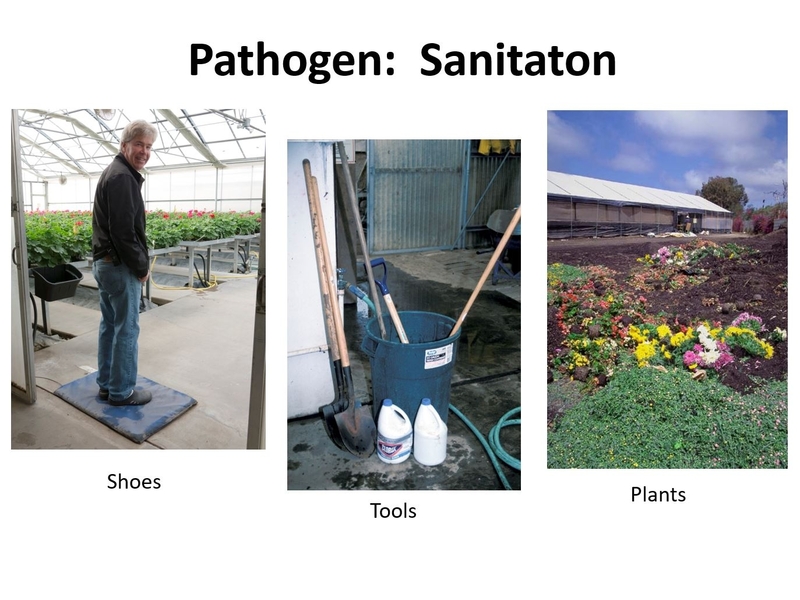 Could you eliminate the pathogen through judicious sanitation practices? Sanitation is a key management practice that employs the strategy of eliminating the pathogen from the growing area. Here, sanitizing shoes before entering the greenhouse. Cleaning soil from tools and sanitizing them before use. Properly covering and disposing of rogued plants or cut flowers (not shown here!). Could you manage leaf wetness and relative humidity to create unfavorable environmental conditions for disease? 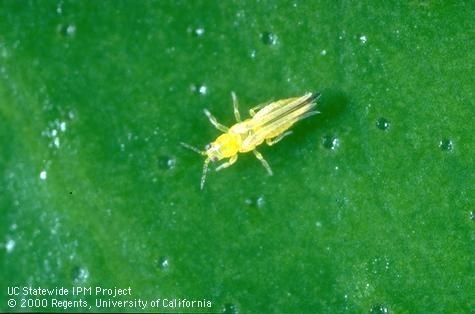 Following the recent webinar on Citrus Thrips presented by Beth Grafton-Cardwell, a second webinar on Avocado Diseases will be offered in November. Check out the Thrips webinar and if interested enroll in the avocado one. View Complete Calendar | Return to What Are the Ag Experts Talking About? 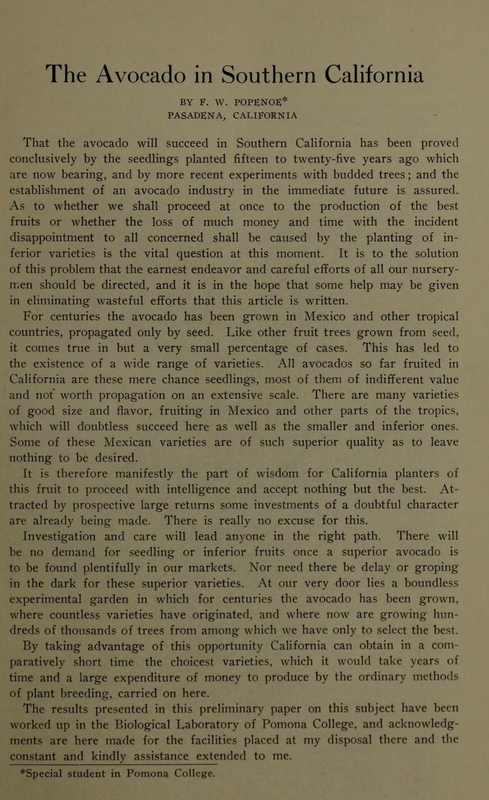 Ben Faber, UCCE Ventura Farm Advisor, will talk about avocado diseases. He will cover the identification and biology of root rot, crown rot, bacterial canker, leaf/stem blight, black streak and sun blotch. Then he will discuss the management management practices to prevent these diseases and the chemicals available to treat them. Resistance management tactics will be discussed. What Are the Ag Experts Talking About? A series of 1 hour webinars will highlight various pest management and horticultural topics for citrus and avocados. During each session, a UC Expert on the subject will make a presentation and entertain write-in questions via chat during and/or after the presentation. As we develop this program, we may expand to other crops. These programs are open to all, but are geared to those individuals, such as PCAs and Growers who need CEUs. Register in advance for this webinar by clicking on the event link above.